a seaward cycle/waking path on reclaimed land from Petone to an overbridge across the railway line near Ngauranga. The analysis is interesting because the seaward option starts to look quite attractive. It has the benefit of protecting the rail line from storm damage, an issue when July storms tore away part of the rail line and disrupted commuter services. It’s also more likely to attract cyclists and walkers that don’t use the current route. Upgrading the existing route, on the other hand, is always going to be constrained to less than ideal widths, and will not attract new users or contribute to the resilience of the rail line. In case you think walking isn’t really realistic on this route, when I biked back from an NZTA reference group meeting a couple of days ago, I met two walkers and a runner on the cycle path – one walker said that she walked from Mulgrave Street to Petone four times a week! 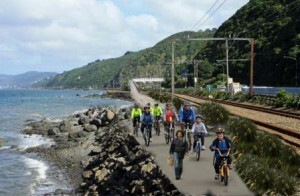 There’s more information about the project on the NZTA Wellington to Hutt Valley Walking and Cycling Link website; you can fill out the survey on your preferences for the route. Great Harbour Way Miramar Ciclovía is coming! 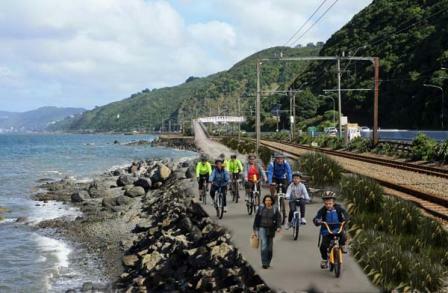 For one Sunday this summer, it will be possible to ride or walk the Miramar Peninsula segment of the Great Harbour Way/ Te Aranui o Pōneke without motor vehicles. Wellington City Council has approved a road closure between Shelly Bay and Scorching Bay for Sunday 16 February. A group consisting of Rotary, the Great Harbour Way Trust, Cycle Aware Wellington, and Living Streets is organising the event, which aims to raise money for a bikes in schools project, as well as demonstrate demand for a car free route around the Peninsula. The Ciclovía concept, of closing off streets to motor traffic in order to provide space for cyclists and walkers, started in Bogota thirty years ago. Since then it has spread around the world. In car oriented Los Angeles, the October CicLAvía attracted 130,000 people (about the population of Wellington City).